Women with this defect should be carefully examined before pregnancy to determine the degree of risk involved. If there is evidence of significant ventricular or tricuspid valve dysfunction, then pregnancy is usually not recommended. Patients with cyanosis face an increased chance of complications. There may be a danger of the formation of blood clots, causing strokes in extreme cases, as a woman's blood coagulates more easily during pregnancy. Other changes in circulation may increase right to left shunting in untreated cases, which reduces even further the oxygen supply to the body tissues. This may lead to further complications that pose risks to both mother and child. 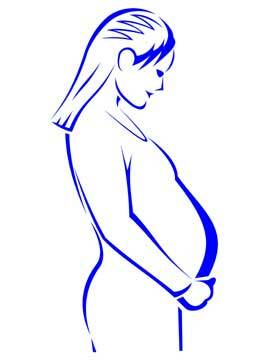 Patients who have undergone surgery in which a conduit was inserted should have it checked before pregnancy. This is to ensure that it is not obstructed and is in sufficiently good shape to withstand the increase in blood flow that will occur. If the patient chooses to proceed with pregnancy, careful monitoring by health professionals is essential. Minimal activity and bed rest are usually recommended, and treatment with anticoagulants and oxygen therapy may be prescribed. Cesarean section may be selected as the safest form of delivery.